We’ve been making great progress on the boys’ room, so I thought I’d bring you up to speed. When I left you last, we had gutted and cleaned out the room. Next, we moved on to all new wiring and insulation. The room is so much quieter than before and there are 11 outlets in the room now! After it was insulated, we built knee walls and hung composite paneling on the ceiling. The composite paneling is quite a bit more sturdy than bead board, had the look we wanted, and was $7 cheaper (per piece) than the bead board alternative. It is now painted white. Drywall went on the walls next. Let me just say…getting it around the corners and up the steps was no easy task. I’m so thankful for helpful teenage sons! 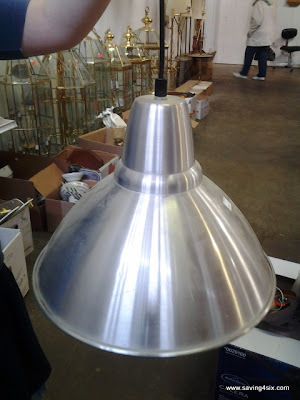 I found several items for the room at ReStore. First was this window. It is absolutely perfect for this space and was only $27. It replaced an old single pane window and has a nice crank on it so it can be opened to let out some hot Summer air. and this Ikea light for $18. I thought I was getting a good deal on the light but it was only $20 on the Ikea website…oh well. I still like it. 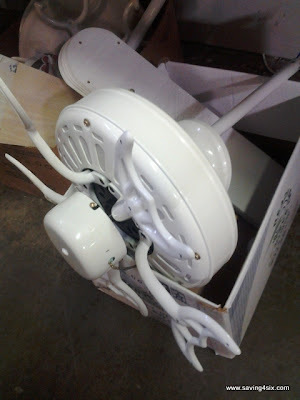 I’ll show you later how we put the ceiling fan and the light together…It looks amazing! The taping, spackling, and sanding was next. That is always such a messy job but it went quickly and I was delighted to get the paint on the walls. The flooring went down next… hickory laminate. We worked together as a family…the boys were cutting the pieces to size and My Better Half and I were laying it. We got the whole floor laid in less than two hours! As you can see, the outlets are all in and functioning. What a difference it will be to have more than TWO outlets in the room! Anyway, we are making progress. If you haven’t seen the furniture yet, check out this post. Well, back to work I go. The finishing touches are always the most enjoyable for me! 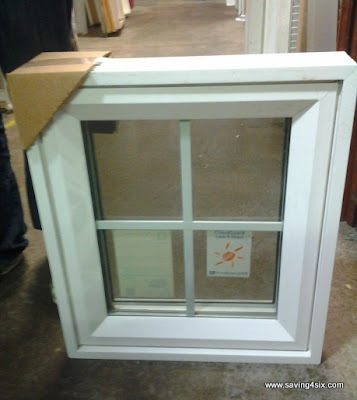 LOVE the progress you have made – and replacing the little window with a crank opening window will be appreciated by all. Awesome job!!! WOW! Love the transformation and I’m sure the boys are loving it too!! There’s alot of love and hard work going on! Great job! This is my first time here, ( I found you via 5 mins. for Mom linky), so I happily followed you on GFC. I think I’d like to hire your flooring crew! This looks amazing!! How exciting for you! I am super impressed at the progress you have made so far, I love it! And the restore is awesome! I am looking forward to the finished project! I love the paneling you picked for the ceiling! I also want to say I so appreciate that you are including your kids in this process – my husband and I both helped our parents with house renovations as children and it has been a huge blessing now that we have our own house and know how to do so many things our peers do not. You are blessing your kids in this! Now, that’s amazing to go from no room to a great looking room ready to be decorated. I’m impressed! Came here via Sugar and Dots, and I wanted to invite you to join my How To Tuesday link party, if you haven’t already. It’s open all week, and the entries are randomized, so everyone’s entry can make it to the top. It would be great to have you! Love the ceiling paneling – this is going to be great.